Most of my friends don’t want to talk about re-distribution. If they’re concerned with inequality (some are and some aren’t), most want to talk about equality of opportunity. “Re-distribution” has taken on the connotation of taking money or property from wealthier people and giving it to poorer people, as if that happens right at this moment as a financial exchange–akin to stealing, violating property rights, etc. Or, maybe akin to land reform, which has happened in many countries across time at points of maximum inequality–the land of the wealthy is expropriated, divided up, and given out to the poor, as in China in 1952. But I don’t know anyone who recommends anything remotely like that as the solution to today’s inequality, so I can’t help thinking that the pejorative connotation to the word “redistribution” is just a part of the conservative scheme and rhetoric–i.e., making “redistribution” seem so extreme, horrible, illegal, unfair, that it just can’t be discussed. I’m compelled to make a point which is not new, but has received less attention than it deserves: I’m fine on focusing on realizing more equality of opportunity, as this too has suffered significantly across the last 30 years, but I’m not willing to concede that there is no basis for a certain amount of redistribution, through progressive taxation, estate taxes, and the like. 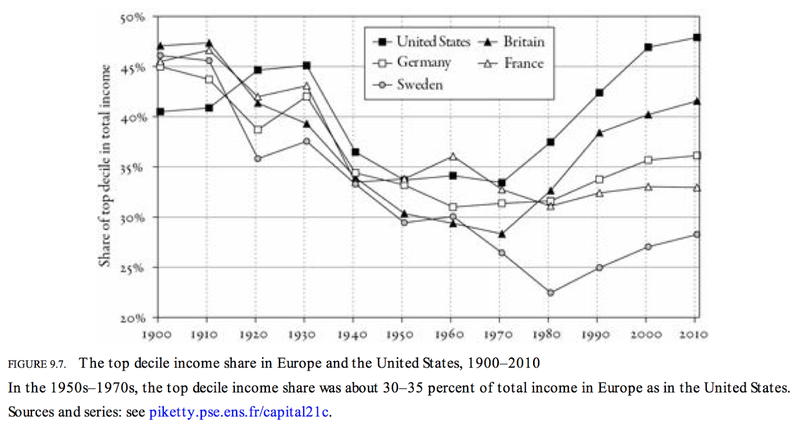 The share of total national income taken by the top 10 percent has increased significantly from 30-35% in 1960 for all the above developed countries (for which there is adequate data), excepting Sweden, which has actually become more egalitarian, although Sweden is moving to rising inequality again now. All the others have seen the share taken by the wealthiest increase since 1960. The change is most dramatic for the US, where the share has risen to almost 50 percent of all national income going to the top 10 percent–taking us back and actually a bit beyond the excesses of the robber baron era! If there is now no dispute that there has indeed been a redistribution upward during the last 30 years, and, of course, this has happened without the kind of dramatic expropriation which conservatives (and all of us) vehemently abhor, then (1) what were the influences or policies which caused this to happen, and (2) can’t we use some of the same or similar to gradually abate the continued rise of inequality? In other words, if we can now agree that we have indeed experienced a form of redistribution upward across the last 30 years, whether or not we can agree on whose “fault” that is or whether this is just a cycle, can we not now agree that we need a similar form of redistribution downward across the next 30–one which does not destroy incentives, but simply moderates and restrains such as to maintain a society in which fairness is felt to exist? Can we not agree that fairness in correcting this redistribution should not be limited to focus on opportunity alone, no matter how important that is also? If we don’t address the trend and reverse it to a degree, our children may indeed be part of the abhorrent form of redistribution sometime down the road. Millions of innocent people died in the chaos in China during the process, and many who did not deserve to have their entire life’s work expropriated, lost all their belongings, and many their lives also. This is not a legacy we want to bequeath to our children and grandchildren. Let’s look at the factors which enabled this redistribution upward to occur. To be fair, these cannot all be fully ascribed to some kind of organized scheme by the wealthy to enhance their relative wealth at the expense of the underprivileged–but some can! First, there was the period from 1940 to 1960 during which the US became more equal. Much of what happened was the result of the two world wars and the Great Depression. Policies enacted as a result of those monumental macro-economic events led us back to the more egalitarian US of the 60s, in which we returned to the kind of egalitarianism which was one of the hallmarks of the patriots who founded the US. Without the progressive taxation post-WWII, reaching up to a peak of 90 percent on marginal high incomes, and without the social programs of the New Deal, without the minimum wage laws of the middle of the century, and other such policies enacted, the return to a more equal society would not have happened. If the two Wars and the Great Depression had not given the US a major shock, the period of greater equality would not have occurred. Left unrestrained, the wealthy of the robber baron era might well have advanced to even greater heights of super inequality than what exists today. We might have experienced a revolution in the developed world, had we not these macro events and the policies which followed them. The correction came mainly as a result of those shocks and the policies installed in the aftermath. But in the 80s, beginning with Reagan’s neo-liberal policies, this set of equalizing policies was reversed. The ethic of the US changed from one more supportive of equality and helping the underprivileged to one of sponsoring individual freedom, entrepreneurism, reducing government, reducing taxes (especially on the wealthy who were argued to be the investors who drive economic growth), and removing protections for workers so as to create more “flexibility” for employers, such as to further stimulate economic growth. The theme gradually changed to believing that growth will solve all problems of poverty and inequality–that there would be a trickle down of wealth as the wealthy invest their tax savings in job creating enterprises. This theory did not prove to be true–see the chart again–the trickle was clearly up, not down. Some of the growth in wealth for the wealthy was the result of honest attempts to improve the economies of the world. Privatization is an example. Beginning slowly in the 1970s and picking up steam in the 80s and 90s, governments in the developed world led the way in privatizing large sectors of the economy which had been government owned. British Telecom is a classic example. Energy, transport, telecom, minerals, water, and finance were at the top of the list. In some cases the process of selling off these assets to private ownership was fair and transparent, and market prices were obtained. But even in these cases, only those with the ability to purchase shares were the wealthy. And, in many cases, Russia and China being examples, opportunity went first to those of high social status or political connection to government officials, and the price was not fair, nor was the process. It remains to be debated, case by case, whether the privatized entity served the public better than the when publicly owned. Many seem to have performed well, and others not so well in terms of the public interest (e.g., privatization of water in Bolivia). Often the motivation of the government was primarily to monetize the asset to solve budget problems, rather than for better service to the public. Asset price recovery: Some was the result of the unusual appreciation of asset values across the period since 1960, which added to the fortunes of those who had asset ownership to begin with. Some was due to inheritance, with estate taxes put back to relatively low levels. Some was due, according to Piketty, to the arrival of the era of the “Supermanager” who gets paid $10 million to run a major company, and his direct reports (the “C class”) get large percentages of such compensation. This phenomenon is found most strikingly in the US, and has confounded scholars who have sought to correlate such compensation to any reasonable measure of individual contribution or corporate performance, and have generally found that there is none–executives are rewarded by the Compensation Committees of their Boards, most often, for results which can be traced only to external events over which the executives had little control. The battle between supporters of an entrenched activist state of the 1950s and 1960s and the growing opposition of a rising force of conservatism seeking to roll back the welfare state and the role of government in general, was eventually won in large part by conservative forces, although certain of entrenched features of the welfare state survived to date–e.g., social security and medicare. Conservative policy incubators were well funded and played a strong role in changing public opinion–such organizations as the Heritage Foundation, the Cato Institute, and the American Enterprise Institute. The movement away from pensions to individually managed 401K programs was sold as beneficial to the public (choice), but lost the advantages of pooling of risks, and many individuals lacked the investment knowledge of pension fund advisers. Tax benefits of such programs went largely to the wealthy, due to their higher marginal tax rates. The main income maintenance program, Aid for Families With Dependent Children was replaced by Temporary Assistance for Needy Families, the latter being more work focused, thus less helpful to those who could not work. Less educated workers became less likely to have access to health insurance than they did a few decades back. The number without health insurance at all has increased. Unemployment benefits were reduced in many states, and legal protections for workers right gave way to more control by the corporation, and thus, less power and influence of labor unions. The Soss et. al. authors show, as does the Piketty book, that the egalitarian US of the mid-twentieth century resulted largely from policies enacted–social and labor policies of the New Deal, the Fair Labor Standards Act of 1938 with its minimum wage guarantee, support provided GI’s returning from WWII, and other such policies. So, any arguments that reduction in inequality since 1940 was simply natural (as Simon Kuznets argued in the 1950s), are simply wrong. Policy changes moved the US back to a more egalitarian society. Likewise, policies changed in the reverse direction beginning with Reagan facilitated the resurgence of the natural forces of capitalism, which left entirely unrestrained, will inexorably toward a more and more unequal society. See Piketty and Soss for extensive support for this argument. Conclusion: There has been a redistribution, no matter whether one likes it or not. It continues in an upward direction at this time. There needs to be some moderating redistribution in the reverse direction. This upward redistribution did not happen naturally. It was not largely the result of competence and merit. It was caused by policy changes. Policies in the reverse are needed to enable a modest correction in the other direction. Let’s start talking about what those might be, and stop wasting time debating whether a redistribution from the underprivileged to the top 10 percent and especially the top 1 percent happened. It did, and dramatically so. As Piketty so forcefully and compellingly argues in his new book, capitalism is a wonderful system, but it cannot be left unrestrained.